Not everyone is blessed with thick hair. There are various reasons like stress, genetics, and other factors that cause us to lose our hair or make our hair thin and limp. You look at all the magazines and feel envious of all the women pictured there with their thick hair styled beautifully? Do you wish your hair could also be styled instead of hanging limp? If your hair is greasy and thin, you’ll know that it’s quite tough to emulate those same styles. Even you buy the latest products to give your hair volume, they don’t just cut it and most of your efforts don’t give you the results you long for. The easiest way to give your hair some body is to use baking soda aka sodium bicarbonate. Forget about using expensive volumizing shampoos and hair care products. Instead, try this simple homemade solution. Daily shampoos tend to leave some residue which stay on your hair making it look greasy after a while. Baking soda is lighter and does not have chemicals or other ingredients that can make your hair look limp and greasy. Just take 4 tablespoons of sodium bicarbonate and mix it in 200 ml of water. Mix it well together so that there are no clumps or lumps formed. You don’t want white goop on your hair later. Use this solution instead of your normal shampoo. 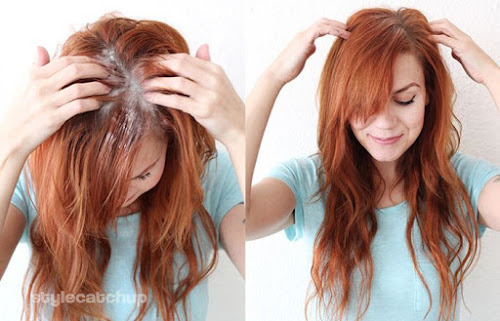 The baking soda dissolves the residue on your hair and will leave it looking shiny. Baking soda also encourages hair growth so it is a double benefit ingredient that will leave your hair looking shiny and healthy longer. The benefits are long lasting, and instead of shampoos which are required to be changed every month, you can use this to add body and volume to your hair.